I’ve had this saw about a month now. It’s a major step up for me being out of woodworking for 20 plus years. Having just built my shop, this is my first major tool purchase second to a dust collector. I’m basically starting all over again. I did a lot of research, read a lot of reviews etc as others have done. I chose this saw for several reasons. 1. Great reviews on multiple websites. 2. Appears to be good enough for an almost retired hobbiest. 3. Dust collection port on the left side of the saw, beneficial to my dust collection plan and layout. So after a month here’s my thoughts so far. I bought this from my local rockler store. I had every intention on picking it up myself but was worried about the weight damaging my tailgate on my small pickup. Spoke with the store manager about delivery. Because I lived close he offered to deliver. To my surprise, didn’t even charge me for delivery. 2 days later it was delivered. Arrived with no damage. Driver placed it in my shop. I had watched and recommend anyone purchasing this saw to watch the videos for assembly instructions on you tube by laguna. I went step by step, video by video and the assembly was a breeze. Hats off to the makers of the videos. I never had to look at the owners manual once during assembly. I did look at the manual when done just to make sure I didn’t miss anything. Take your time when putting it together. Extra set of hands makes it easy. Make sure everything is dead on before proceeding to the next step. Making a sled was a snap and was perfect on the first try when everything was dialed in. Now on with the review based on 30 days of experience. It’s a very nice saw. All adjustments during the setup were only minimal. It’s very smooth, quiet, (85 decibels) fence is smooth, accurate, easy to remove and install. With a zero clearance insert, dust builds up inside the cabinet rather quickly. The picture above shows the dust inside the cabinet after about 50-100 rips. I will be looking Into a secondary overhead collection. This is the only reason I gave everyone it a 4 star rating. Other than that i’m very pleased with the saw. 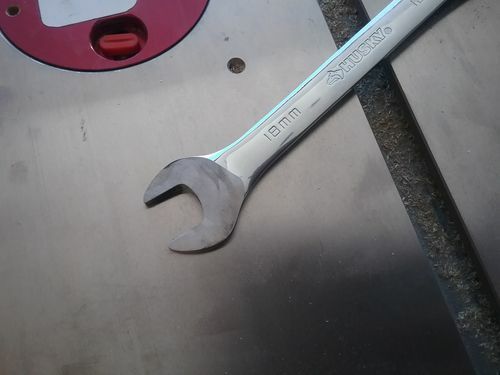 Use this to loosen and tighten your bolts to align the table to the blade. 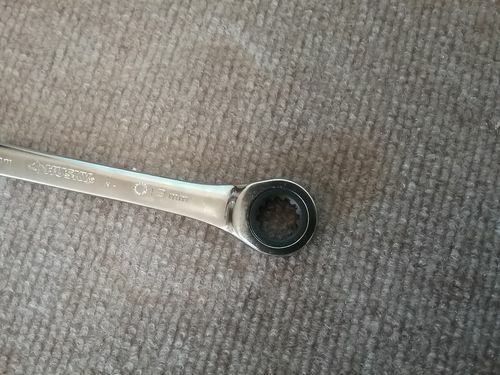 There isn’t much room to get any other wrench (open or closed end) in the small openings. Found out the hard way by thinking the bolts were tight when they were simply hitting the edge. Ruined my sled when they became loose during a cut. Not all is lost as I can still use the sled for dados and make a new sled. Thanks for your opinion. This saw is on my radar for when I upgrade so it is good to hear of peoples experiences with it. Laguna has some nice products out these days. Congrats on a great new saw! I have always liked the miminalist, simple lines of this saw. Laguna tools look great. Their dust collectors and bandsaws are a thing of beauty. I’m surprised that much dust collects inside the saw. Is the dust shroud too small, or why do you figure this is happening? I’d take the interior hose off or put a Y in it so it can’t build up. Can you shed some light on why you think this saw is a good choice, for you, over others? I see a lot about Grizzly saws and Saw Stop—but not much about Laguna—what convinced you that this saw was a better one for you than the Grizzly or Saw Stop ones? Thanks for the review and insights! I honestly don’t know why there is so much dust within the cabinet after so few of cuts. There is very little dust on top of the table when done wit a cut. I have a brand new Jet vortex cone dust collector. All my joints are sealed internally and externally with a/C sealant on the inside and a/c sealant/foil tape on the outside of the ductwork. I have approximately 20’ of metal duct run with 2 90’s (2×45’s making up the 90’s) and about 5’ of flex hose from the blast gate to the table saw. SawsStop was out out of my price range and although they have a great safety feature, I’ve been in construction most of my life , , I feel confident in my safe use of a table saw. Yes I know it only takes one incident but it’s the risk I’m willing to take. There are not a lot of table saws with the DC port on the left side, which is a must for my shop. I designed my small shop (22×20) so there are no ceiling or wall ran ducts. I’m not sure what you mean by taking the interior hose off and put a “y” on it? I’m going to add to the review and say that the brackets that hold the fence on the side of the cabinet when not used are inconvenient by being on the opposite side of the operator. When switching frequently from a sled to the fence, you’ll find it not worth it and not an option with an out feed table. Also, the brackets that hold the push stick on top of the fence didn’t work well for me. Very hard to snap into place. Not a big deal for me because I don’t like/use plastic push sticks. I removed the brackets, traced the design of the push stick and made my own. I love the fence, the saws reasonably quiet, easily maneuverable (see their video) very smooth and just a good saw in my opinion. Thanks for the review. I’m currently daydreaming about my next saw (new woodworker who has quickly outgrown my PC portable TS). Thank you so much for this review. I am currently struggling with this decision. I believe I have it narrowed down to the Grizzly G0715P, G0771Z, the Laguna Fusion, or the Jet 708494K. I would rather go with the Grizzly 715, but with all of the problems I have read about the alignment issues I am worried. Of all of these saws I mentioned, I have yet to find a review about the Laguna that said it had any issues at all except for dust collection. I am thinking it is worth the extra couple hundred bucks. I intend to have this saw forever anyway so $200 or $300 seems worth it for such a long term investment. This saw is at the top of my TSAW list. Sawstop doesn’t turn me on and I feel that technology breeds contempt for the tool. Keep your hands away from the spinny bits. I was glad to see your review and that you really don’t have any major complaints about the tool. I agree with your review. I have two additional comments. I don’t have a problem with the amount of dust but would like to know if anyone has adapted a hinge system or some other way to open the side cover to get to the sawdust buildup? I hate having to unscrew the 4 screws overtime I want to vacuum out the saw. I am trying to figure out a way to make the operation easier- I would clean it out more often with my ShopVac. Hermit, thanks for your thorough review. It, along with months of research, helped me decide to order the Laguna Fusion. Laguna recently introduced the new Fusion 2, Model No. MTSF236110175-0130, which is now on sale at M&M Tools. I’m still awaiting shipment, but I understand that the new model addresses the dust collection issue by adding a hose within the cabinet. Laguna also improved the arbor rising mechanism and tilt micro adjustment. And, it redesigned the throat plate, making it a rectangular shape. Looking for a real tablesaw. I’m not a pro, but a newly retired engineer type looking for some fun. I was at Rockler today and noticed they had an original Laguna Fusion for $1170 (10% off so they can start stocking the new F2 version). In looking at F2 specs, it looks like it weighs 80 pounds less than the “classic” Fusion. I don’t see how it could be of similar quality at all with the lighter weight. Does anyone have any real info on how the old Fusion compares to the new F2 and F3? I know the F3 has a 3hp motor. The old Laguna Fusion seems to get pretty good reviews. The only review I can find on the F2 isn’t very positive. I’m really stuck here between jumping on the Laguna Fusion at a good price (plus no shipping charge if I have them pop it in my truck, or going with maybe a Grizzly 1023 flavor. I am a little concerned about the 1 3/4 hp motor on the Fusion. I just ordered the fusion 2 – replacing my Ridgid 4512. Can you tell me if you use an 8” or 6” dado set? Also, what blade do you use for a replacement blade? Full kerf or thin kerf? I will be ordering an f2 in the next few days and I noticed the weight on Rockler as well. If you look at the specs on other sites the original fusion and the f2 are only a few pounds different.